New York Harbour is sometimes called "Hudson's Bay". In late spring (May), large chunks of ice float near the eastern shore of the bay, while to the west, the centre of the bay remains frozen. Between 1971 and 2003, the length of the ice-free season in the southwestern part of the Hudson Bay—historically the last area to thaw—had increased by about 3 days. Hudson Bay (French: baie d'Hudson) is a large (1.23 million km²), relatively shallow body of water in northeastern Canada. It drains a very large area that includes parts of Ontario, Quebec, Saskatchewan, Alberta, most of Manitoba, parts of North Dakota and Minnesota, and the southeastern area of Nunavut. A smaller offshoot of the bay, James Bay, lies to the south. The IHO lists Hudson Bay as part of the Arctic Ocean. On the east it is connected with the Atlantic Ocean by Hudson Strait, and on the north with the rest of the Arctic Ocean by Foxe Channel (which is not considered part of the bay) and Fury and Hecla Strait. Geographic coordinates: 78° to 95° W, 51° to 70° N.
The Eastern Cree name for the Hudson and James bays is Wînipekw (Southern dialect) or Wînipâkw (Northern dialect), meaning muddy or brackish water. Lake Winnipeg is similarly named by the local Cree. Hudson Bay was named after Henry Hudson, who explored the bay in 1610 on his ship the Discovery. On this fourth voyage he worked his way around the west coast of Greenland and into the bay, mapping much of its eastern coast. The Discovery became trapped in the ice over the winter, and the crew survived onshore at the southern tip of James Bay. When the ice cleared in the spring Hudson wanted to explore the rest of the area, but the crew mutinied on June 22, 1611. Sixty years later the Nonsuch reached the bay and successfully traded for beaver pelts with the Cree. This led to the creation of the Hudson's Bay Company, which bears its name to this day. The British crown awarded a trading monopoly on the Hudson Bay watershed, called Rupert's Land, to the Hudson's Bay Company. France contested this grant by sending several military expeditions to the region, but abandoned its claim in the Treaty of Utrecht (April, 1713). During this period, the Hudson's Bay Company built several forts and trading posts along the coast at the mouth of the major rivers (such as Fort Severn, Ontario, York Factory, Manitoba, and Churchill, Manitoba). The strategic locations allowed inland exploration and more importantly, facilitated trade with the indigenous people, who would bring fur to the posts from where the HBC would transport it directly to Europe (which incidentally is a shorter distance than from Montreal). The HBC continued to use these posts until the beginning of the 20th century. This land, an area of approximately 3.9 million km², was ceded in 1870 to Canada as part of the Northwest Territories when the trade monopoly was abolished. Due to a change in naming conventions, Hudson's Bay is now correctly called Hudson Bay. As a result, both the body of water and the company are often misnamed. Hudson Bay has a salinity that is lower than the world ocean on average. This is caused mainly by the: 1) low rate of evaporation (the bay is ice-covered for much of the year), 2) the large volume of terrestrial runoff entering the bay (about 700 km³ annually; the Hudson Bay watershed covers much of Canada, with many rivers and streams discharging into the bay) and the annual melt of sea ice provides a significant source of fresher water to the surface layer (about three times as much as the rivers), and 3) limited connection with the larger Atlantic Ocean (and its higher salinity). The western shores of the bay are a lowland known as the "Hudson Bay Lowlands" which covers 324,000 km². The area is drained by a large number of rivers and has formed a characteristic vegetation known as muskeg. Much of the landform has been shaped by the actions of glaciers and the shrinkage of the bay over long periods of time. Signs of numerous former beachfronts can be seen far inland from the current shore. A large portion of the lowlands is part of the Polar Bear Provincial Park. 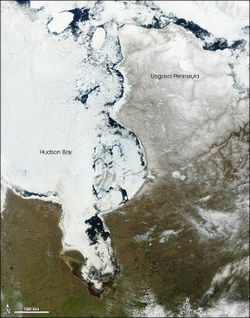 There are many islands in Hudson Bay, mostly near the eastern coast. All are part of the territory Nunavut. The main group of islands is known as the Belcher Islands. The coast of Hudson Bay is extremely sparsely populated. There are only about a dozen villages. Some of these were founded in the 17th and 18th centuries by the Hudson's Bay Company as trading posts, making them part of the oldest settlements in Canada. With the closure of the HBC posts and stores in the second half of the 20th century, the coastal villages are now almost exclusively populated by Cree and Inuit people. Not until the Cold War was there any military significance attributed to the region. In the 1950s, a few sites along the coast became part of the Mid-Canada Line, defending North America against a potential Soviet attack over the North Pole.